Lemons are staple crops throughout the world. Used in drinks, desserts, meals and for health properties, millions of tons of lemons are produced each year. Lemon trees require a particular climate to grow on a mass scale. Certain nations are better locations for growing lemons than others. Lemons are native to India, northern Burma and China. Burmese, Indian and Chinese cuisines all use the fruit. The Meyer lemon originated in China. The origin of that variety are not fully understood; it is believed to be a cross between a standard lemon and Mandarin orange. The Meyer lemon grew solely in China until it was exported to California in 1904. Southern Europe was the first locale to receive the lemon tree from Asia, but Iraq and Egypt were the first countries to cultivate and grow the fruit tree on a mass scale outside of Asia. China remains one of the biggest lemon exporters. Italy and Spain are the largest exporter of lemons in Europe. The two nations make up nearly 90 percent of the continent’s lemon production. Lemons have been grown commercially in those two countries for more than 1,000 years. Argentina is a major producer of lemons. The nation averages 1.16 million tons of lemons each year, making it one of the foremost lemon-producing countries in the world. 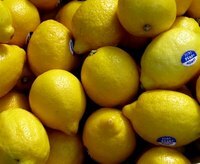 The United States is one of the top five producers of lemons. California, Florida and Arizona are the top producing states in the U.S., combining to produce nearly 800,000 tons of lemons each year. Lemons, along with oranges and grapefruits, make up the second largest fruit export of Australia. Australia, though not a key producer of lemons, is an ideal location for growing the tree. The temperate slopes and plains of New South Whales and South Auckland are the nation’s top lemon-growing sites. Brazil is a top producer of lemons. The vast, undeveloped farmlands provide ample space for lemon orchards and the temperate climate in Brazil produces more than 1 million tons of lemons per year. Lemon trees grow best in mild climates; nations with severe winters are not capable of producing sustainable lemon crops. Nations such as Mexico, India, Iran and Turkey are among the top 10 lemon producers in the world.